Iamsick.ca, the app that helps Canadians access healthcare, is extending its reach beyond Ontario with support from its crowdfunding campaign on Indiegogo. It’s raised just over $2,700 on its $9,000 goal. Iamsick.ca is the work of Ryan Doherty, a PhD candidate in medical biophysics at University of Toronto. We actually quoted Doherty during the federal government’s CODE 2014 Hackathon in Toronto, back in February. There he joined up with a few fellow Canadian geeks and created an app that’s triggered whenever there’s an earthquake in Canada. Back to iamsick, it first launched its crowdfunding campaign a few weeks ago to boost its Canadian presence, until now exclusively in Ontario. 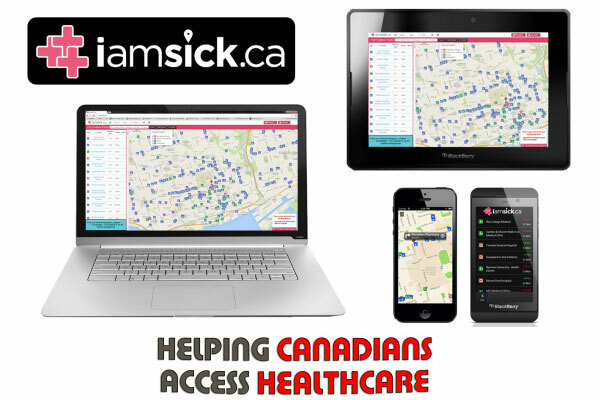 Accessible from any computer, tablet, or smartphone, iamsick guides patients to the nearest open clinic, urgent care centre, hospital emergency room, or pharmacy. The app also helps patients find healthcare providers who speak their preferred language. Doherty and iamsick are primarily trying to help those who experience trouble in communication, to find the right clinic. Particularly in a multicultural nation like Canada, the app has some pretty obvious potential to land in people’s iPhones and Androids. Launched in the fall of 2012, iamsick displays the nearest healthcare options – including hours and contact info for nearby clinics, pharmacies and hospitals through its app that simplifies the search for same-day health care. The free iamsick app is available for BlackBerry 10, iPhone & Android.